IOA is one of that rare breed of setters who have given us both crossword and crossnumber (ie mathematical) puzzles. His last Listener had Alfred Hitchcock films as its theme and was a word puzzle (although it did include The 39 Steps). Before that, we had The X-factor, which had nothing to do with Simon Cowell, but was a mathematical. This week, some fun and games were in store with LED digits that you will see on your calculator — when you switch it on. 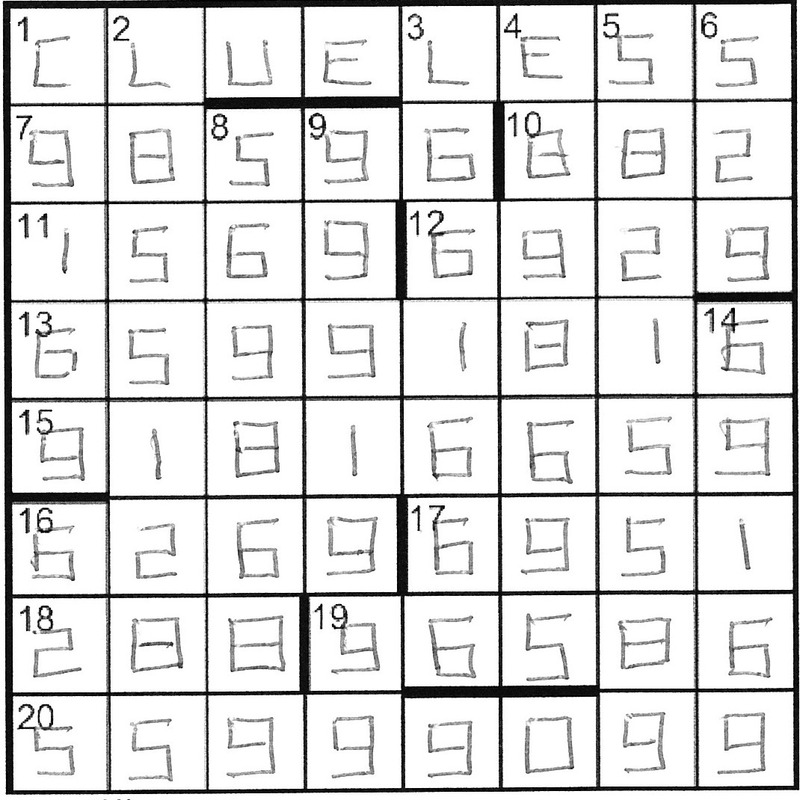 The filled grid would retain 180° symmetry, both with the bars and the entries. This meant that we were restricted to the digits 0, 1, 2, 5, 6, 8 and 9, each of which remained the same when rotated except for 6 and 9 which became 9 and 6 respectively. It didn’t take long to see the entry point: the symmetrically-placed 6dn and 16dn were both squares and could only be 121/121 (grid entries were not necessarily distinct), 196/961 or 529/625. 10ac was double a square, and its last digit was the middle digit of 6dn. Thus 196/961 was excluded as 6dn since double a square could not end in either 9 or 6. It therefore ended in 2. The only values for 10ac with the available digits were thus 162 (81×2), 512 (256×2) or 882 (441×2), with the symmetrical 18ac being 291, 215 or 288. 18ac was not the product of two primes, which excluded 291 (3×97) and 215 (5×43), giving 10ac as 882 and 18ac as 288. The same list of 30 valid squares helped with 7ac/19ac, with 7ac beginning with 9. There were only five in the list, and the possible values for 19ac which had digits summing to a Fibonacci number were 60816 (21), 96586 (34), 52266 (21) and 95866 (21). 60816 resulted in 9dn starting with 0. Additionally, if the 4th digit of 19ac were 6, then 5dn couldn’t be a string of Fibonaccii numbers (610 is the only such number less than 1000 containing a 6). Thus 7ac/19ac were 98596/96586. 5dn was now ·8····8·, and by quick inspection had to be ·8215589, resulting in 11ac being 1569. 2dn must be 68551281, 68551282 or 68551285, but the first sums to a square (36) and the second to a prime (37). 8dn begins 56 and must be 1673²×2+1 to 1688²×2+1. Only the last contains the available digits, so 4dn/8dn is 6898695/5698689. By inspection, 12ac/16ac is either 6925/5269 or 6929/6269, but only 6269 sums to a prime. 9dn must be 9991999 (summing to Fibonacci 55) and 3dn 6661666. I had all the digits of 13ac/15ac and they agreed nicely with their clues. Finally, the third two-digit number of 20ac must be 90 to give 55999099 (with pairs summing to 343) and it didn’t take long to delete the eleven small segments in the top row, 66066655 to give CLUELESS. Not a difficult mathematical this week, enabling me to describe my solution in detail (decipherment of scrawled notes permitting). However, it was a novel and enjoyable puzzle nonetheless, so thanks to IOA. This entry was posted on 11 September 2015 at 4:00 pm	and is filed under Solving Blogs. You can follow any responses to this entry through the RSS 2.0 feed. You can leave a response, or trackback from your own site. Dave, as always, I love your display!